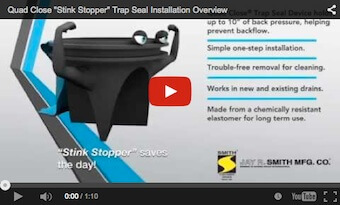 Watch The Quad Close® "Stink Stopper" In Action - Jay R. Smith MFG Co. The Quad Close® "Stink Stopper" In Action! In the episode of Follow “Stink Stopper” as he discovers a stinky drain and uses his sleek and innovative design to block sewage odors at the source. View various benefits of the Smith Quad Close® Trap Seal Device, including various sizes for all applications, trouble-free removal for cleaning, backflow prevention and much, much more.